Home→Edible plants→Fruiting vine→Welcome, shark fin melon plant! Welcome, shark fin melon plant! 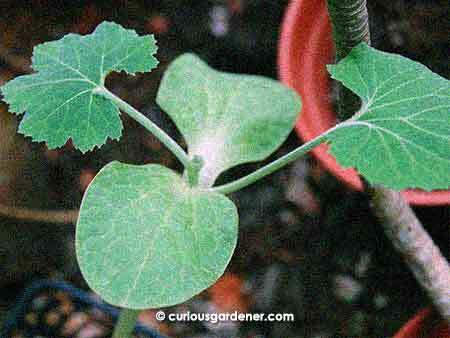 The shark fin melon plant with its first true leaves. Aren't those seed leaves big?! The Weeds have struck again, introducing yet another new plant to me. Prior to a conversation with Mother Weed several weeks ago, I had never heard of the shark fin melon. The name alone gave me a mental image of a triangular, pointy-shaped melon, but no, it’s a normal rounded kind of melon – pleasantly colored and marked, too. How it earned its name is from the way the flesh shreds when cooked, into soft, chewy strands reminiscent of shark fin soup served in Chinese restaurants. Well, thanks to The Weeds, I now have both seeds and a very strong looking shark fin melon seedling, and I think this plant is going to feature quite a bit on our respective blogs for a while because it’s new to us! Online hunting, of course, yielded much information on this melon – like its Latin name, cucurbita ficifolia, which means “fig leaf”. As the name suggests, the leaves apparently resemble fig leaves, so it’s commonly known as the fig-leaf gourd. Well, I guess since we’re in Asia, we swing along with the more Asian designation of the shark fin melon. I was quite happy to read that although this plant is an annual in temperate climates, it can be a perennial in tropical regions! Like the sweet potato plant, it can take root along the stem at leaf joints, which I guess, helps with its longevity. I foresee that we are going to have to designate a nice section of real estate for this plant to spread out, as the vine can grow up to 15 metres long! 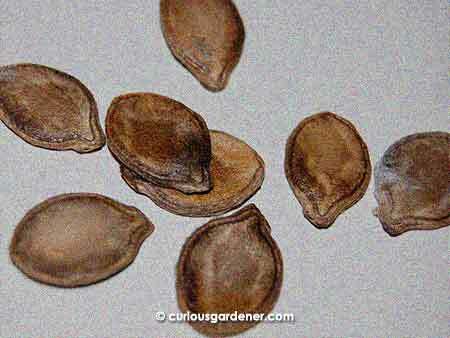 Shark fin melon seeds, also from The Weeds. Germinate and grow into big healthy fruitful plants, you seeds! if kept dry after harvest, a fruit can last several YEARS! Someone is asleep – but he will be super excited to see your post! The vine grows fast, super fast. Very similar to a wintermelon. We have not seen any signs of roots at the nodes, so I wonder if it is a different species from the Mexican version? Mother Weed, going by our sweet potato plants, the roots will grow where the stems touch the ground – ground being earth that the roots can grow in. I think you’re training your plants upwards, so the rooting will likely not happen. Check with the rellies who are growing this, just to be sure. Have you transplanted your seedling or are you going to wait til it’s got more true leaves? My seedling from Weed is a step behind yours, so I think I’d better wait for a while before transplanting in case it is too weak…? I don’t have the big size pot I’d want to transplant it to yet, so I may do an intermediate transplant to one of my black planting bags first. Luckily Weed gave the seedling in a biodegradable cardboard cup that’s already disintegrating. I can just stick that into the bag, which I can tear up when I do the next transfer.